Pluribus Networks offers a unique and highly differentiated approach to SDN that goes beyond basic SDN architectures with its Netvisor Network Operating System (OS). Netvisor is a fully abstracted and virtualized Network OS that provides a best-in-class layer 2 and layer 3 networking foundation with a distributed Fabric intelligence. Netvisor virtualizes the Open Switch hardware allowing a single switch to instantiate multiple virtualized network devices. Netvisor enables the Adaptive Cloud Fabric which operates without a controller to deliver an elastic and distributed holistic network. The scale-out architecture delivers multi-terabit capacity with predictable performance and latency and supports millions of concurrent connections. 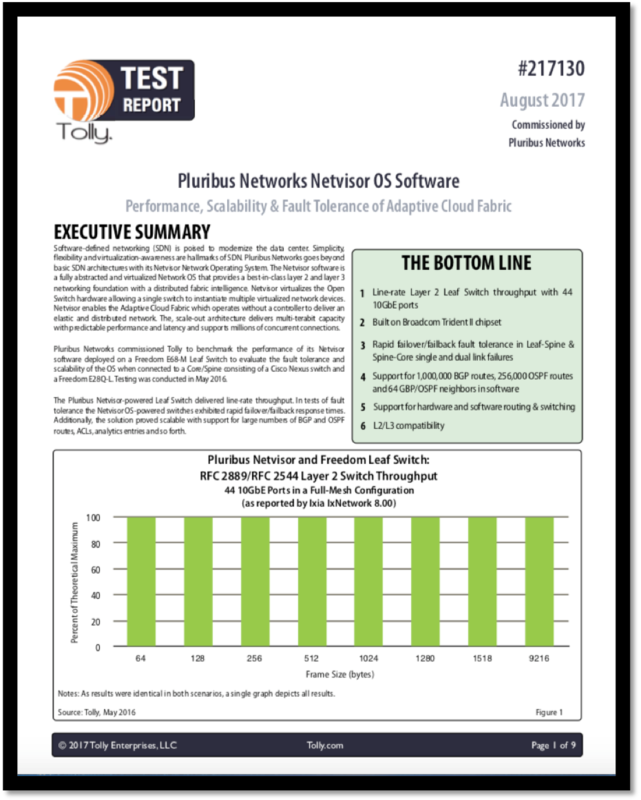 Pluribus Networks commissioned Tolly to benchmark the performance of the Netvisor OS to evaluate the fault tolerance and scalability of the OS when connected to a Core/Spine consisting of a Cisco Nexus switches. The Pluribus Netvisor powered Freedom Leaf Switch delivered line-rate throughput. In tests of fault tolerance the Netvisor OS, the switches exhibited rapid failover/failback response times. Additionally, the solution proved scalable with support for large numbers of BGP and OSPF routes, ACLs, analytics entries and so forth. Download the report to see what was tested.